It is not just a lovely image; no, they are even two lovely images. The Friday Image No.015 and No.015a. One from the bottom up to where the land starts and one with the tree and its reflection in the water, both equally wonderful. Now, IMHO, there are two centres of attention. I wish we would have this kind of fog in my part of the country as often as you seem to have over there in the UK; here, the coastal areas of the Netherlands, there is nearly always too much wind. Thank you. I’m pleased you like the image. To be honest, these sorts of conditions are quite rare in the UK also. 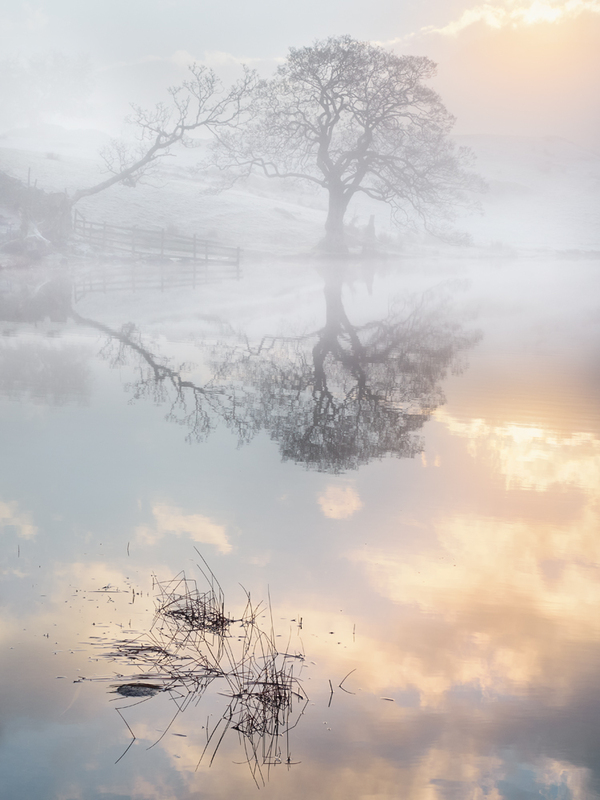 But when the temperature does drop you can get some wonderful images if you get yourself near to still water. I agree with Leen two lovely images combined into one, the scene is so peaceful and tranquil. Thanks. It does have an ethereal quality doesn’t it. What a beautiful image. So atmospheric. I love the pastel colours. Thank you. More to come from the same location. That is beautiful. Well-seen. Well done! Thanks. I bet it makes you want to get back the lakes.